Cameron (left) grew up in Davis, California and moved to Colorado in 2011 to attend college. They are currently living in CU Boulder's sober living community and finishing their undergraduate Psychology degree. 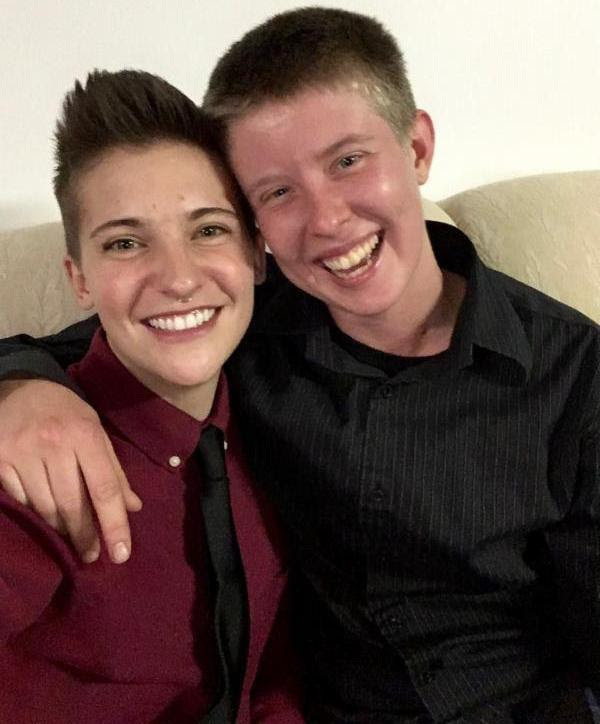 In August 2017, before transferring to CU Boulder and in the process of discovering they were trans, Cameron started a queer student alliance, Queers United In Pride, at Front Range Community College's Boulder County campus. The wonderful people Cameron met in QUIP helped introduce them to the many resources that Out Boulder County provides and Cameron began to attend OBC's weekly Trans and Genderqueer Support Group and volunteer through their Speaking Out program. Cameron also volunteers with the education team and works as an on-call advocate at the Safehouse Progressive Alliance for Nonviolence, which has remained an incredibly safe and nurturing environment for them in their process of self-discovery. Cameron feels endlessly grateful for all the ways in which Out Boulder works to create safe and validating spaces for queer youth and adults.